The Island President may not be coming to Independent Lens until next season, but audiences don’t have to wait to see the story of former President of the Maldives, Mohamed Nasheed. In February, former President Mohamed Nasheed made headlines when he was forced to step down after the Maldivian police and army turned against him. 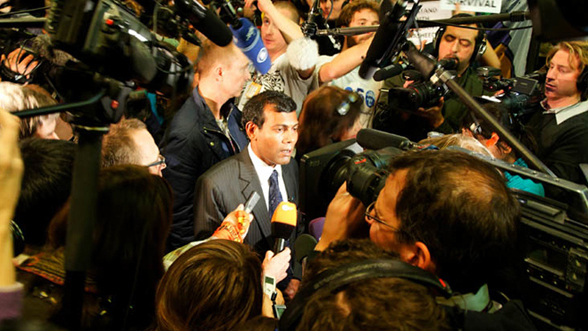 Prior to the coup, President Nasheed was known for his impassioned stance on climate change and was rewarded by being pushed out of office earlier this year, after the documentary concluded filming. The Island President follows Nasheed as he worked tirelessly to motivate the world to take action before the rising sea levels wiped out the Maldives, giving a human face to an issue that continues to threaten his country. The Island President opened in theaters in New York on Wednesday, March 28th and will be coming to San Francisco (March 30), Los Angeles (April 6), Washington DC (April 20), San Diego (April 20), Minneapolis (April 27), and Detroit (April 27) throughout the next month. Additional cities will be added soon and will be posted to film’s website. Watch the film&apos;s trailer after the jump.